"I would move heaven, hell, and anything in between to get to you. You wouldn't be safe anywhere if I was mad at you." I strongly believe that everyone is born with an inherent talent. Some are drawn towards music, some towards sports, while others display an innate knowledge of science or mathematics. In the case of Richard Kuklinski, his specialty just so happened to be murder. A killer-for-hire referred to as "The Iceman," Kuklinski murdered over 125 people before his arrest in 1986. In 1992 and 2001, HBO's America Undercover set out to probe the mind of this killer, and entered Trenton Maximum Security Prison to film the two-part documentary, The Iceman: Confessions of a Mafia Hitman. These specials mostly consist of candid interviews with Kuklinski, as he bares all, telling how he made a career in violence. Both episodes are fascinating portrayals of a man who, outwardly, appears to be an atypical violent personality. Watching Kuklinski speak about his unimaginable profession is like watching someone discuss a casual daily affair. He relates the grisly details of his crimes with a gentle speaking voice and a laid back attitude, which is more chilling than if he had raised his voice or shown the slightest hint of aggression. Kuklinski attributes much of his apathy towards violence to his father, a mean-spirited, rage-aholic who used to beat his son regularly. Growing up as the victim of violence, Richard eventually strode that inevitable path himself. When he committed his first murder at age 18, he described his initial reaction as fear and sorrow for the victim. Yet shortly thereafter, he said the fear turned into a feeling of power. Richard had now found his calling, and figured he might as well be paid for something he has a knack for. Kuklinski then became connected with powerful mob families, and embraced killing as his profession. This is a vocation that he describes as an opportunity for tremendous wealth, offering him the ability to earn near the high end of five figures per murder. Murder became the method in which Kuklinski was able to support his loving wife and three children, all of whom believed that Richard was a mild-mannered businessman. In addition to the plentiful background information on this vile executioner, insight is also provided, by Kuklinski himself, as to the heinous methods in which he bumped off his victims. Kuklinski murdered by knife, by gun, and by Molotov cocktail, but his specialty was cyanide. He relates a startling account of how he once poured cyanide into a glass of beer and casually bumped into his victim, drenching him in the liquid. By the time the lethal poison had begun to seep into the victim's pores, Kuklinski was long gone. Another harrowing story details how he used the chaos and noise of a crowded dance club to covertly plunge a hypodermic needle into a hapless soul. When the interviewer asks Kuklinski what was in the needle, he soberly responds, "In his case? A heart attack." While most of his killings were business-related, there were times when Kuklinski murdered individuals who simply made him "mad," and others who died merely for the sake of "practice." One of the most astonishing moments of Iceman is Kuklinski telling the story of how he murdered a man by shooting him in the forehead with a crossbow. This unfortunate stranger was not killed for money, nor was his death the result of anger. Kuklinski confesses, "I just wanted to see if this thing worked." In addition to admirably documenting the life of Richard Kuklinski, Iceman also has an effective way of sending shivers down the viewer's spine. I watched in astonishment as Kuklinski candidly discussed the gory details of his profession without breaking a sweat. Unlike Charles Manson, whose overtly evil didacticism almost comes across as absurd, Kuklinski's relaxed confidence and tranquil demeanor make him all the more frightening. A good example is when Kuklinski describes how one of his victims feverishly prayed to God before his imminent death. Kuklinski gave him half an hour to pray, and told him that if God changed the circumstances within that time, he would let him go. As Kuklinski finishes the story, "God did not change the circumstances." Though his words chilled me to the bone, Kuklinski tells this story as if he were discussing the weather. There is an undeniable evil within him, but also a serene disposition for such a ruthless murderer. Even Kuklinski's wife, Barbara, describes their home as "The all-American family" with a perfect life. Iceman features footage of home movies shot at the Kuklinski household, and they appear to be the happiest of families. Kuklinski later describes the love he has for his family, and admits that he wanted nothing more than to provide a good life for them. Unfortunately, the only way he knew how was through contract killings. Kuklinski never shows any sign of remorse when describing the innumerable murders he's committed. However, he breaks down as he expresses his feelings of regret for misleading his family. He does not want forgiveness from the families of his victims, but he begs forgiveness from his own family. While somewhat monotonous, Iceman is an incredibly effective documentary. I went into it with the fear that the subject matter would be sugar-coated, especially the mob material, but I ended up pleasantly surprised. The filmmakers do not hold back in disclosing details, particularly Kuklinski's relationship to the Gambino crime family. Many important mob names are revealed, including Roy DeMeo, the Mafia capo who gave Kuklinski his first shot at contract killing. There are also interview segments with Dominick Polifrone, the undercover agent who brought Kuklinski's homicidal streak to an end. If I have one gripe, it would be that the dramatizations are a bit unnecessary. There are also many redundancies between the 1992 and 2001 episodes, though I imagine this is somewhat necessary, as they need to cater towards those viewers who have not seen both installments. Otherwise, each episode covers its own unique ground. The earlier is an all-encompassing look at Kuklinski's life, from his childhood to his arrest, while the later piece offers more insight into the specifics of his murders. Overall, both episodes are insightfully entertaining, yet sobering. The unrelenting nature of this reality piece certainly got underneath my skin. Image Transfer Review: The 1.33:1 full-frame image is comprised of various source material of varying quality. The black and white dramatizations prove to be most problematic. These video-based scenes exhibit horrendous deficiencies, such as shimmering, moir�, and jaggies. While also video-based, the interview sections are more pleasing. Black level is deep and colors are well balanced with accurate fleshtones. Minor grain is evident, but not terribly irritating. Overall, this is a pleasant visual experience, free from major distractions. Audio Transfer Review: The stereo soundtrack is acceptable for a production of this nature. The audio is predominately based around dialogue. Though there are times when spoken words sound horribly distorted, the majority of them are clean and intelligible. I was pleased to find an expansive presence from the music; the instruments form a nice blend throughout the front soundstage. Like the video presentation, the audio is a pleasant transfer that suits the film well. Extras Review: I was not expecting any special features, but the lack of the obvious is gravely disappointing. First, there are no subtitles recorded. It should be standard practice for all DVDs to contain at least one subtitle track. Secondly, the main menu screen is exasperating. There are no chapter selections, simply a one page static menu that allows the viewer to choose between the 1992 or 2001 documentary. Due to the generic icons, it is near impossible to tell which section has been selected. I initially selected 2001 when I thought I had selected 1992. It would not have taken much effort to offer an irritation-free menu system. 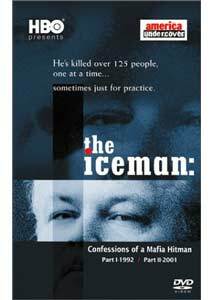 While a somewhat lackluster DVD presentation, The Iceman: Confessions of a Mafia Hitman is highly recommended to anyone with an interest in learning about real-life Mafia executioners. Filled with startling confessions from the notorious contract killer, Richard Kuklinski, this documentary held me captivated throughout its duration.